Tyler Warren RPG Battlers – 2nd 50 | Create Your Own Game! Tyler Warren is back with 50 more colorful characters created in the spirit and style of classic RPGs! 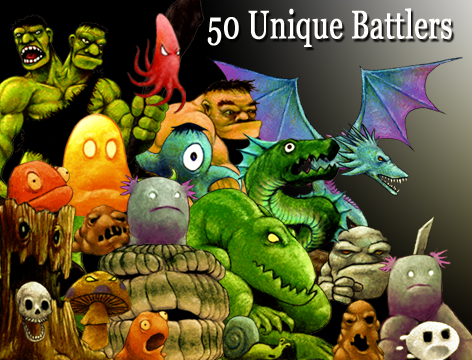 Created in the spirit of early console RPGs, this pack of 50 battlers by artist Tyler Warren brings 50 more fresh options to the professional and amateur game creator. Carefully crafted in a style comparable to the immensely popular Dragon Quest (Dragon Warrior) series, this set features monsters ranging from cute to colossal. Trolls, bugs, slimes, elementals, beasts, animals, flyers, and many others. 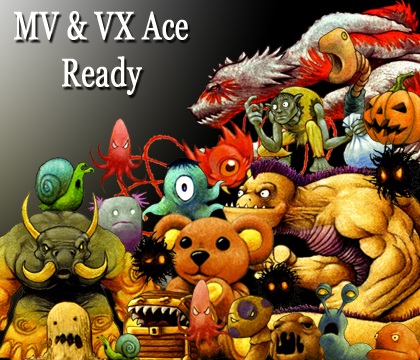 Recently remastered for use in MV and VX Ace.